There was never meant to be just one. Parts, pieces for the blending. The pairs, the duets the circles of multiples. A community of several and many has power. To blend, enhancement happens en masse. More interesting than the lone wolf crying in the wilderness. A haunting howl, in the separated from the pack. In community, a fellow writer links the lonely. And all the others their voices too. Like incense, an offering up and to and for. Single beauty, facets on the face of a multi-sided gem. Pull the plug on the hemmed in notes. But unfurl the sails and set free the voices of each who has something quite beautiful to say. This month at Tweetspeak Poetry, we are exploring the word prompt, Surreal. Stretching and writing in community with others. The voices are beautiful over there. set free the voices, yes… of words we have yet to share. You sweet one. I feel like you catch my voice and my heart every time I write and speak. It is a rich blessing. Your heart is so full of understanding and compassion. Thank you as always, friend. Wow, Elizabeth. 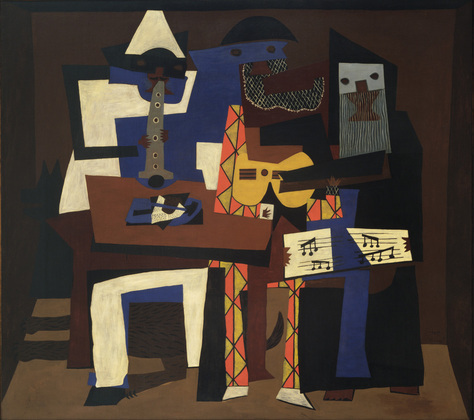 Last Sunday, I sat in a living room with my small group, discussing community as I looked right at this Picasso. Amazing. Grateful for your beautiful poetry, once again, and for the community I’m able to share with you.